– Vanity that is not PRO: Averting your eyes from road to computer to check your speed mid-descent. 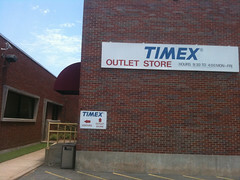 Of the many charms of the hometown of Competitive Cyclist, North Little Rock, AR, is that the only North American Timex repair, customer service, & distribution center is here. Part of the operation is an outlet store -- a treasure trove of off-price watches, GPS systems, and Ironman paraphernalia. Revel most of all in their ‘nick & dent’ area, where last week I found an MSRP $140 ‘Perpetual Calendar T’ model with a metal bracelet. It was $35 due to a dent invisible to my eye, and they were kind enough to swap it out to a black Sri Lankan-sourced ‘leather’ band at no extra cost. It’s timelessly stylish (the adverb ‘timelessly’ regarding a watch is rich, no? ); it has a stainless steel case; and is waterproof to 100m. My lovely left bike racing wrist is saved, and any accidental disrespect to the memory of my beloved grandfather is avoided. I’m ready to pin on a number in a most PRO style. My late June tan makes me radiant. I’m as skinny as I get. My snap in the crits is sizzling. And, now, I am flawlessly accessorized. Being fast is grand, but looking PRO is a superior thing. I encourage you to do the same, and here’s an incentive to do so: If you win a USA Cycling-sanctioned race in the month of July (category is immaterial) while wearing an analogue wristwatch, we’ll send you a $50 Competitive Cyclist gift card. Post your name, the result, and a race photo (yes, we need visual proof) to our Facebook wall and we’ll send the card posthaste. And if you regale us with a story of an extraordinary victory salute (one not already recorded here), we will consider sending you a bonus 6-pack of Miller High Life. – Roadies are a preening, overspending lot. We’re the athletic answer to molecular gastronomy, i.e. we seek deliverance through expensive minimalism. At its most refined, being a road racer is a dedication to the essential streamlining of the rider/bike duality, which is why on a commute to work or an otherwise utilitarian road ride, nothing is more stifling & horrible than a backpack planted on one’s back. I wonder if mountain bikers ride not because they love to ride, but -- not unlike absurdly overgeared dayhikers with their would-be 10th Mountain Division shin-high boots and ambitiously-named packs (viz. ‘The North Face Patrol 35’, ‘The Gregory Whitney 95’) -- they’re on the trail so they can play dress-up with equipment their day most certainly doesn’t demand. Riding with a backpack is a hors categorie circle of hell. What does your 2-hour trail ride require that you can’t fit in a pocket? And please don’t say ‘hydration’ -- these packs are massive beasts with skeletal systems, circulatory systems, & central nervous systems. Lend the damn thing your bike -- it could ride on its own without you. It has nothing to do with Charles Darwin, sorry. Rather it’s the first name of an old friend whose neurosis about drivetrain cleanliness and the precision of its alignment & adjustment was like parachuting into the brain of Howard Hughes. It was an Olympian obsessiveness -- and if it’d been harnessed for something productive he would’ve been a Senator or a billionaire or a Pope. Instead his passion was in dissecting a rear derailleur to search and destroy drag in its remotest forms. Darwin’s Spruce Goose-like mania for the eradication of the flawed & the impure was not matched by a use of advanced methods for assessing on-the-bike improvement. He never used a powermeter or even a computer, and instead he measured drivetrain sanitization by putting his bike in a workstand, shifting into a middling climbing gear (i.e. 39×17) and with a repeatable amount of force he’d spin the cranks backwards to see how many revolutions he’d get. The more revs, of course, the less drivetrain resistance. Ever-skinnier chains, ever-lighter pedals, ever-more overgreased freehub body pawls: Does reverse-spinning resistance really tell us anything about overall (forward-spinning) mechanical resistance? And, compared to riding in the hoods vs. riding in the drops, does drivetrain drag mean much at all? – A datum all-too-often cited to quantify race difficulty: Average speed. Is there a more worthless statistic? I’m not talking about comparing it to kj’s or TSS or any of the other PhD-level powermetric benchmarks available at modest cost to an intellectually curious bike racer. I’m thinking of average speed in light of the most basic common sense: If this week’s hourlong crit was 1mph slower than last week’s, but the 1st half average was 18mph and the 2nd half average was at 30mph, this week’s 24mph average was doubtlessly more agonizing than last week’s steady 25mph. Please, please fall back on your 8th grade algebra and stop the correlation between ‘hard’ and average speed. – Finally, a huge congratulations to Michael Barry of Team Sky for making its Tour de France squad. 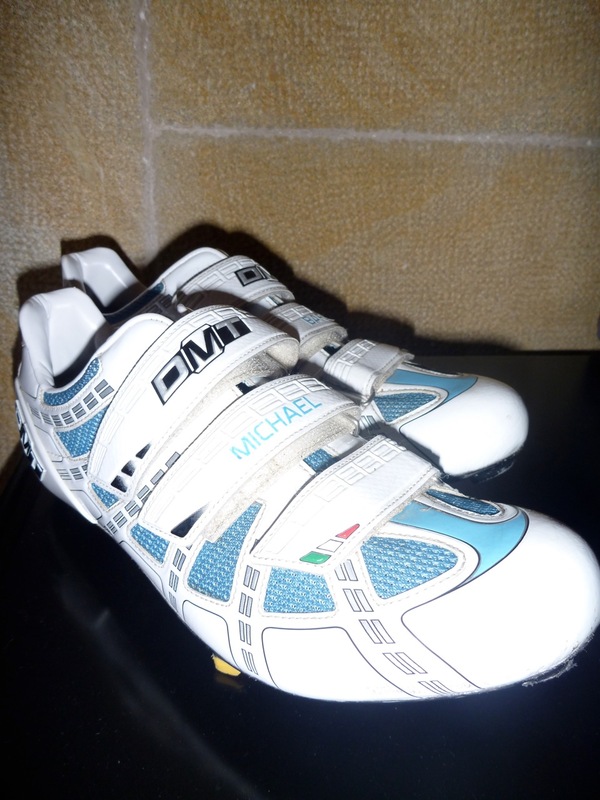 His relentlessly steady team performances throughout the year -- he brought his big boy shoes every day from Het Volk all the way through the Giro -- made him a slam dunk choice for what will be (amazingly) his maiden ride at le Tour.